The one activity that I perform all day long in the kitchen (not including cleaning up) is wrapping or covering ingredients and baked goods with plastic wrap. I also use plastic wrap for myriad other things including rolling pie dough, and covering cookie dough when rolling it to keep it from cracking. I use thicker freezer-weight plastic wrap for storing things in the freezer to prevent freezer burn.I've written on this blog about my favorite plastic wraps, stretch-tite and the wider, thicker, freeze-tite. The stretch-tite company also offers simple slide bars that slip onto the cutting edge of the plastic wrap boxes to make cutting off a piece of plastic wrap in one smooth piece safe, and easy. 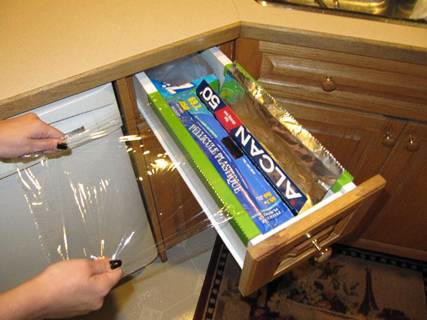 If counter space is at a premium, and you prefer to keep your plastic wrap in a kitchen cabinet drawer, there is now a brilliant solution! Blogger Wendy C. recently posted about a terrific new device, cleverly called Wraptor Teeth. It was designed by Hank Elash and marketed by him, his wife Sandee, and family out of Vancouver, BC. Wraptor Teeth is a one-piece molded plastic bar with teeth on the top that quickly, easily, and securely slips onto the side of a cabinet drawer varying from 3/8", 1/2", 5/8", and 3/4". It accommodates a standard size box of plastic wrap and makes it possible to leave the box in the drawer and to use two hands to pull out a sheet of plastic wrap, which helps to keep it flat. It also works for wax paper, parchment, and foil. The plastic teeth are sharp enough to cut through the wrap but not so sharp as to cut your fingers. Check out their site and YouTube Video and, like me, you probably won't be able to resist purchasing a set of two or more.